Over at Numero Cinq, Benjamin Woodard praises the "breathtaking execution" and "strong cinematic elements" of Mauricio Segura's Eucalyptus, translated by GG winner Donald Winkler. 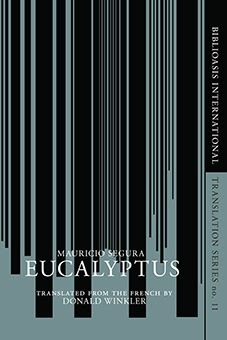 The most recent title in Biblioasis's International Translation series, Eucalyptus is "an existential whodunit" that is part murder mystery, part dictatorial thriller, and part exploration of racial and identity politics in Chile and beyond. As protagonist Alberto Ventura, a Chilean born writer living in self-imposed exile in Montreal, returns to his 'homeland' in order to attend the funeral of his father Roberto - a contentious man whose various legacies as student radical, hospital director, manual labourer and farmer provoke contradictory and occasionally hostile response from intimates and acquaintances - he comes to realize that the circumstances surrounding his father's supposedly natural death seem to be far more complicated that he initially bargained for. What follows is Alberto's self-imposed detective hunt, mediated by a chorus of unreliable narrators whose accounts "seamlessly segue, à la a film dissolve, into representative scenes[...]luring the reader and resulting in a ghostlike journey: passing through bodies, into minds, and then back again." Citing Segura's avoidance of "you can't go home again" clichés and his "fascination in more oblique questions: What is home? Who truly belongs to a parcel of land?" Woodward finds that Eucalyptus culminates in "an adventurous, hypnotic read." Hurrah! Labels: Benjamin Woodard, Biblioasis International Translation Series, Donald Winkler, Eucalyptus, French Literature in Translation, Mauricio Segura, Numero Cinq, What is Home?